Japanese-Israel military intelligence collaboration in cyber security was at the center of bilateral defense agreements reached in Tokyo Monday, May 12, between Prime Minister Shinzo Abe and visiting Prime Minister Binyamin Netanyahu, debkafile’s military and intelligence sources report. The two leaders agreed to join forces against China’s cyber war capabilities, some of which Beijing has transferred to Iran’s Revolutionary Guards and the North Korean armed forces. 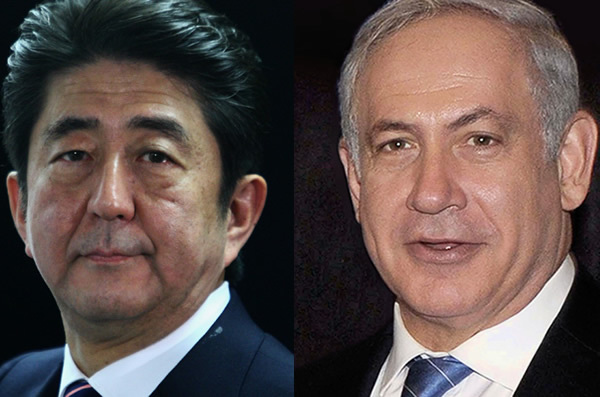 Netanyahu and Abe agreed that Israeli cyber specialists would visit Japan to help set up cyber security programs for combating potential attacks on military infrastructure, strategic utilities and companies. Officers of Japan’s Self-Defense forces would also visit Israel to attend Israel Defense Forces courses on this subject. More exclusive details about the cyber collaboration agreed on between Japan and Israel in the coming DEBKA Weekly out next Friday. Speaking at a joint news conference after their meeting, the two prime ministers "expressed their strong hope for the early resolution of various issues of concerns regarding North Korea, including its nuclear development," Netanyahu added that Abe had told him in no uncertain terms that “Japan was facing a very real threat from North Korea,” which is believed to be preparing for a fourth nuclear test. “The same words – 'clear and present danger' – certainly apply to the Iranian nuclear program as well," the Israel prime minister said. debkafile adds: This was the first time the Israeli prime minister had openly mentioned a prospective Iranian nuclear test like those carried out by North Korea. "Like North Korea before it, Iran wants to keep its military capabilities, military nuclear capabilities while easing the sanctions that are applied to it,” Netanyahu said. "We cannot let the ayatollahs win." Tuesday, May 13, Iran and the five permanent members of the UN Security Council plus Germany are scheduled to meet in Vienna and begin drafting the text of a comprehensive and nuclear deal, which Israel has challenged for failing to dismantle Iran’s nuclear military capacity. Sunday, on his first day in Tokyo, Japan’s Kyodo news agency, citing an unidentified government source, reported that Netanyahu is also set to hold talks with Abe on bilateral cooperation in dealing with cyber attacks. This kind of comment is rarely heard from Japanese officials who tend to be tight-lipped on the highly sensitive military issue. However, the Israeli prime minister’s visit to Tokyo coincided with Abe’s push for Japan's highly competent military to take a more active role in world affairs, and expand the scope of is activities beyond the limitations placed by its constitution since World War II.